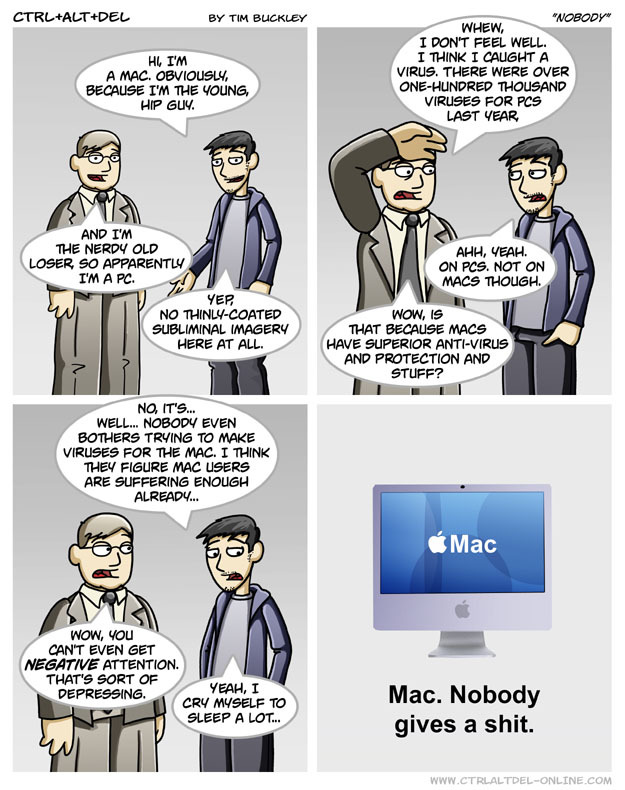 CTRL + ALT + DEL "Nobody"
Who would have known that the popular series of Mac vs. PC commercials would generate a parody of their own? Update (2007/02/17): I also posted a video of the original commercial this is a parody of. Thanks to Bryan F. from Quincy for this one. A middle-aged woman went to a plastic surgeon for a face lift. The surgeon told her about a new procedure called "The Knob", where a small knob is placed on the top of a woman's head and can be turned to tighten up her skin to produce the effect of a brand new facelift. Of course the woman wanted "The Knob." Over the course of the years, the woman tightened the knob, and the effects were wonderful. The woman remained young looking and vibrant. "All these years, everything has been working just fine. I've had to turn the knob many times and I've always loved the results. But now I've developed two annoying problems. First, I have these terrible bags under my eyes and the knob won't get rid of them." The doctor looked at her closely and said "those aren't bags, those are your breasts!" She said, "Well, I guess there's no point in asking about the goatee!"